For a long time we have been shopping only offline, in „traditional“ retail stores. With the likes of Amazon.com and eBay people started the perks of online shopping. However, traditional retail is far from dead. Actually, traditional retail makes up about 92 percent of total retail sales. There are several reasons to that. Besides infrastructural reasons (e.g. bad logistic for home-delivery) the biggest reason is the physical presence of objects. 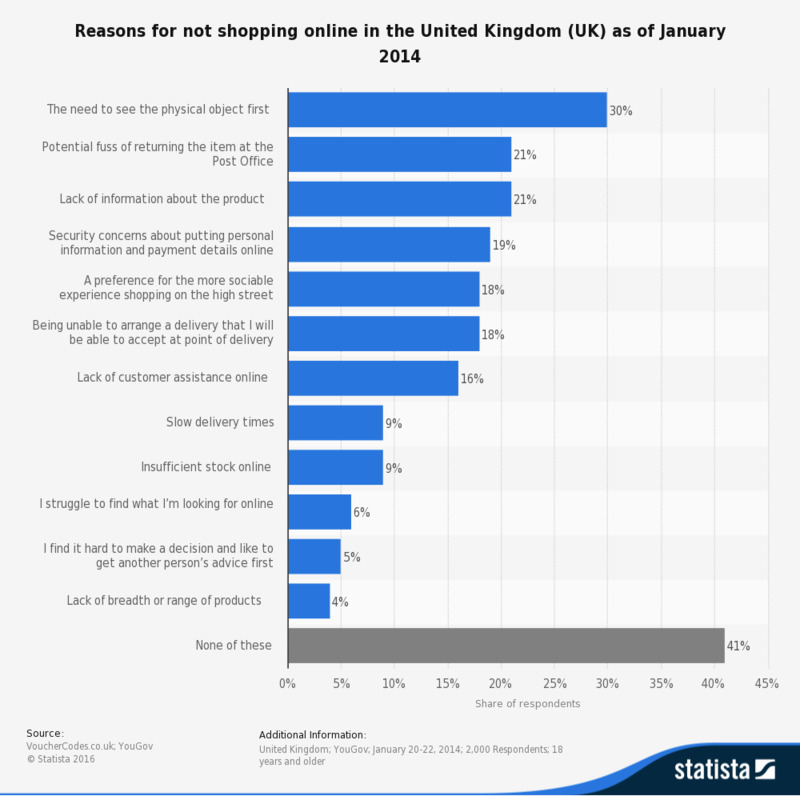 In fact, when asked why they do not shop online, around 30% of respondents in the UK said that they need to see the physical object first. Studies about e-commerce attractiveness falsely assume that customers buy known objects and innovations in the same way. However, this is not true. Take you back to the 18th century an imagine there were only e-commerce shops and no traditional retailers. You hear about a new invention that cleans your clothes without your help called „washing machine“ . How willingly would you spend, let’s say $500, on an unknown product that „automagically“ cleans your cloths? If you are not an innovator or early adopter you probably would be very skeptical. What you would do is wait for a friend or colleague to buy it and then check out his machine. Once you know that and how it works, you would not need your friend anymore and be far less if not at all concerned buying your washing machine online. Project yourself „back to the future“ and you see how that applies to traditional retailers as well. It depends, of course, on the type of product, but at an very early age, the introduction phase of the product life cycle, people need physical evidence of a product to understand and trust it. There is just so much a product description can tell you. A big part of product adoption is product experience, something that online shops cannot give you. 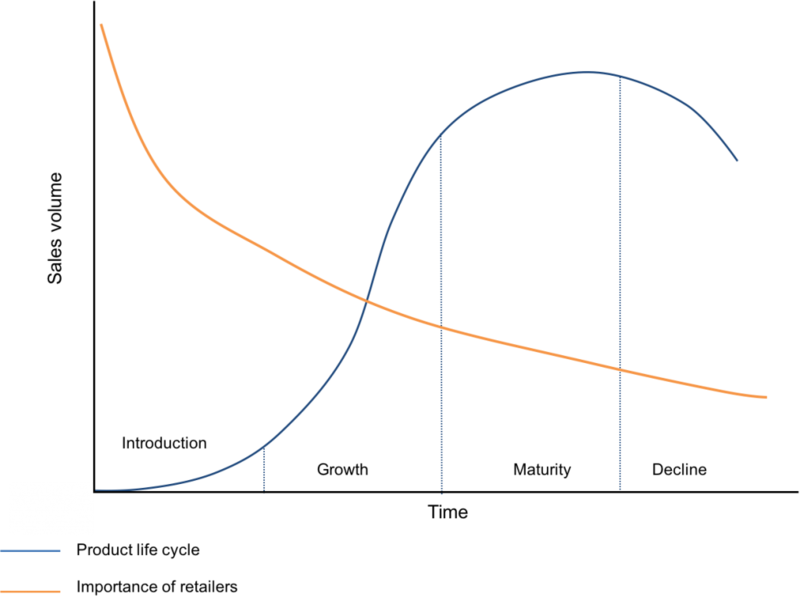 Once the market is saturated and companies shift their focus from R&D and product innovation in the introduction phase of the product to process innovation and manufacturing in later stages and coster-leadership overtakes differentiation people do not care about the product’s physical attributes that much anymore. They know how the product feels and looks, what interests them are specs and price. Both things which they can obtain online. So, where does that leave retailers? Judging from the life cycle-based relevance of retailers for shoppers (and leaving other factors such as price beside) retailers must go from selling to servicing. They should encourage customers to visit their stores to see, test and experience products. Instead of having large inventories they should focus on consultation, distribution (same-day delivery) and after-sales services (recycling products, warranty: picking products up from customers and sending them into repair etc.). They should also collaborate with start-ups in a similar fashion Amazon is doing with Launchpad. They need departments that source for suitable products on kickstarter and the like, invest in them and distribute through their stores. Through that start-ups get a powerful distribution channel and retailers a good argument to attract tech-savy customers. Previous Post:[Case Study] Should You Rehire a Defector? Next Post:Gaming “the” application for VR?